“Tropical Island Paradise” is our second proposal, following on from our “Streets of Monaco” design. For this design the theme centres around a secluded island paradise, with elements inspired by the islands of the Caribbean, Indian Ocean and Polynesia. 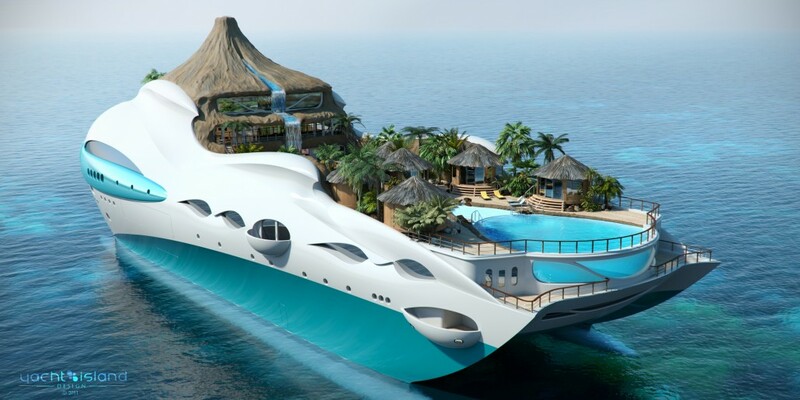 This yacht has an overall length of 90m, a beam of 33m, a draft of 8m and is designed to accommodate 10 guests. 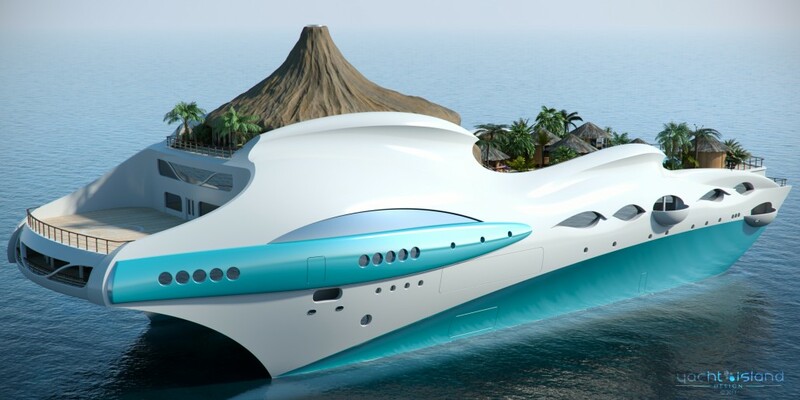 A diesel electrical power plant propels the vessel to a maximum speed of 15 knots. The hull will be constructed of steel with the super structure a mixture of aluminium and Composite. 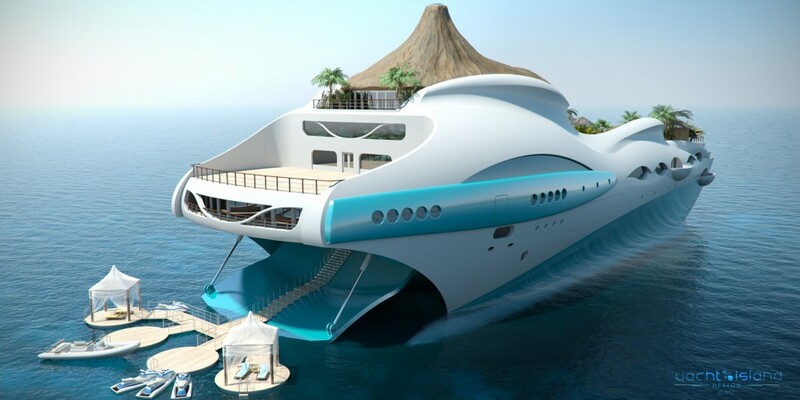 The exterior was designed to give the impression of waves breaking around a volcanic island, whilst maintaining the look of a contemporary yacht design. The main exterior deck is a private beach “cove” with a voluminous ocean view swimming pool, fed by a stream emanating from a cascading waterfall on the volcano. Around the pool are a number of private cabanas, nestled between palm trees, offering a relaxing outlook over the pool and ocean beyond. Behind these cabanas there is a bar area, communal seating and an area for outdoor dining. !e aft deck is a dedicated helicopter landing platform. 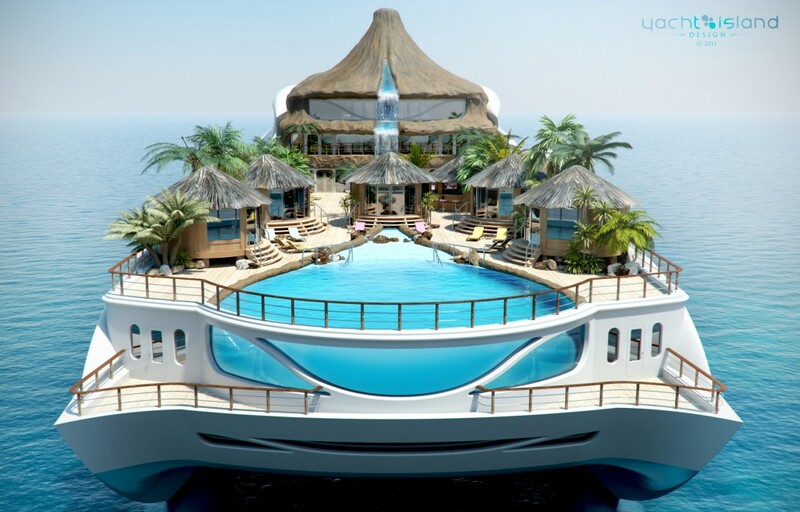 A unique feature of this yacht is the deployable foating beach islands, giving a sea level platform from which to enjoy all manner of water activities or just relax in one of the foating cabanas. 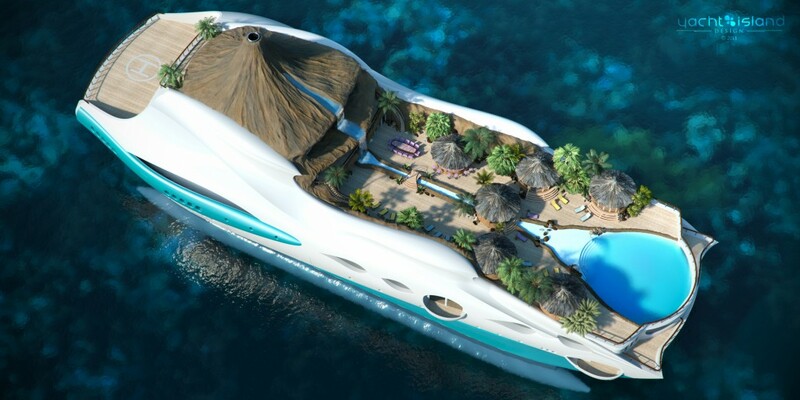 The interior features an owners suite located inside the volcano and spread over two decks. Its living room balcony affords views out over the front of the yacht from behind the waterfall. Located behind the owners bedroom is the owners private spa and balcony. Further accommodation takes the form of four VIP suites all having private balconies and direct access up into the main deck cabanas. Indoor entertainment is catered for by way of a cinema, library, games room and gym, with relaxation options in the form of a fully equipped spa and a multitude of lounges each offering their own unique ambiance.